Most of this report was researched, written, and edited by Weiping Li, James Losey, Tom Risen, and Sarah Myers. Azerbaijan, host of the 2012 Eurovision Song Contest, has faced a number of digital disruptions as it prepares to host the annual singing competition this week. 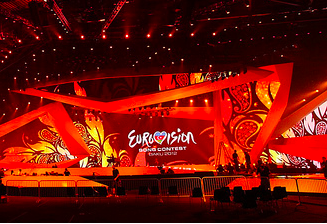 The song contest websites www.eurovision.az and www.eurovision.tv have been the subject of a cyber attack by an unknown group, followed a day later by the shutdown of a major mobile network which affected more than a million Azeri users. The government has meanwhile, announced it is taking steps to expand broadband Internet infrastructure in the country, helping more of its citizens to stay connected. An embarrassing situation has recently come from recent criticisms of the Azeri government's approach to human rights and the Internet. In the last edition of the Netizen Report, we reported that the Azeri government has used intimidation to prevent people from participating in online social networks. Last month, an investigation by Swedish news show Uppdrag Granskning revealed that the government has spied on its citizens with equipment supplied by the Swedish telecommunications giant Teliasonera. Among the more nasty outcomes of the surveillance was the interrogation of several Azeri citizens just because they voted for an Armenian song in the 2009 Eurovision contest. For more information about the state of freedom of expression in Azerbaijan, a report released last year by the Media Rights Institute is available here. Last Sunday afternoon, Pakistani social media users found the Twitter website blocked for several hours, with mixed reports on access continuing throughout the day. While the reason for the site's censorship remains unconfirmed, an Express Times correspondent claimed it was the result of tweets about a “blasphemous” competition of Prophet Muhammad’s caricatures, which Twitter refused to take down at the Pakistani government’s request. Others suggested it may be part of government tests of its url filtering system. The blocks ended after the Pakistani Prime Minister issued an order to unblock Twitter; however, the incident has once again cast a shadow over Internet freedom in Pakistan. In South America, Venezuelan netizens also experienced censorship of news website La Patilla by a state-owned ISP, possibly due to a video and livestream of a prison in Venezuela which recently experienced clashes between inmates and guards. Several legislators in different countries have proposed to take legal action to regulate the Internet in the past week: in Russia, a Duma deputy called for the Prosecutor General of Russia to prosecute those who use social media to spread extremism. The Bolivian Senate has also proposed a bill to restrain expressions of racism and discrimination on social networks. Indian IT Minister Kapil Sibal has said he will call a meeting of MPs and stakeholders to discuss the ‘Information Technology (Intermediaries Guidelines) Rules 2011’ in response to protests by opposition MPs against the rules, which critics believe give the government excessive censorship and surveillance powers. The Bahraini government has announced plans to prosecute people who upload video footage of protests to the Internet. In other areas of the Middle East: Kuwaiti blogger Lawrence al-Rashidi was sentenced to ten years in prison and fined 1,000 Kuwaiti Dinars for insulting the crown prince online; an unknown blogger in Iran was arrested for trying to “disturb public opinion”; Syrian authorities released eight journalist and bloggers who were arrested during a raid on the Syrian Centre for Media and Freedom of Expression (SCM) in Damascus, although there are still 31 activists and journalists being detained. The US Supreme Court agreed to hear a case concerning the government's use of electronic surveillance to monitor international communications by people suspected of having ties to terrorist groups, including journalists and lawyers who represent prisoners held at Guantanamo Bay, Cuba. London’s Metropolitan Police have outfitted 16 boroughs with technology that allows authorities to gather and retain phone data of a suspect held in custody within minutes, regardless of whether the suspect is eventually charged. According to the Wall Street Journal, Sina Corp, a Chinese social media company, reported a loss in the first quarter of 2012, possibly due in part to rising costs in hiring personnel to censor its content. Iran has threatened to sue Google for not labeling the Persian Gulf on Google Maps. Facebook – whose Friday stock market launch (IPO) has been called a flop – is being sued for US$ 15 million in California for by users who claim the company invaded their privacy by tracking their Internet use even after they logged out. Reacting to the IPO, the Paris-based Internet rights group Internet Without Borders is calling for an “electronic union whose aim will be to raise awareness and introduce the public debate on personal data” – given that companies such as Facebook are clearly seeking to exploit users’ personal data for financial gain. Iran’s telecommunications ministry has ordered local banks, insurance firms and telephone operators not to use foreign-sourced email services such as Google or Yahoo to communicate with clients. US Congressman Darell Issa, who defended the Internet against the Stop Online Piracy Act, has published a leaked older draft of the US negotiating position of the Trans Pacific Partnership (TPP) on his crowdsourced Madison platform. Thus far, the TPP has been negotiated in secret and Congressman Issa has called for more information to be released on the process and text. Fifty leading US legal scholars wrote an open letter to the Senate Finance Committee arguing that the only constitutional process for ACTA ratification is through Congress. The Netherlands is the first country in Europe to establish a legal framework supporting net neutrality. Over thirty civil society organizations from around the world sent a letter to International Telecommunication Union (ITU) Secretary-General Dr. Hamadoun Touré calling for “full, equal, and meaningful participation of civil society stakeholders” in the World Conference on International Telecommunications. Bipartisan support is growing in the US Senate to support Internet freedom as a priority ahead for the International Telecommunications Union, which in December will debate whether to extend the 24-year-old treaty to include free governance of the Internet. The World Summit for the Information Society (WSIS), a multi-stakeholder forum for discussion of the Internet's future, was held in Geneva last week. The future of Internet governance was reportedly a hot and divisive topic. A Finnish court ruled the owner of an open Wi-Fi network is not liable for copyright infringement by others using that network. Meanwhile, an Indian court has ordered a variety of websites to be blocked including Vimeo, DailyMotion,The Pirate Bay, and Pastebin due to copyright infringement. The Pirate Bay suffered a massive distributed denial of service (DDoS) attack that took the site offline for 24 hours, likely in response to its criticisms of an Anonymous-led DDoS campaign targeting Virgin Media. Virgin Media was the first ISP to act on a UK court ruling that the Pirate Bay website must be blocked by ISPs. Zambian Watchdog, a citizen news website in Zambia, reported that their website was hacked on behalf of the Patriotic Front government. Amnesty International’s website became a source for malware after attackers exploited a Java software vulnerability on their site. In a separate incident, some users have started seeing advertisements on Wikipedia, which the non-profit site says means those users have been infected with malware. Jeremy Hammond, a member of LulzSec, an offshoot of Anonymous, pleaded “not guilty” in New York federal court against a number of charges. Hammond is suspected of masterminding last year’s hacks of the security think-tank Stratfor in addition to downloading credit card data from Sony Pictures Entertainment, InfraGard Atlanta and a number of other websites. Researchers showed that hackers can remotely control many of the Internet connected security cameras used by banks, retailers and corporations. The China-based mobile and networking equipment vendor ZTE admitted that there is a backdoor planted in one of its models which could allow others to gain root access; the company has pledged to release a security fix. Vint Cerf, one of the “fathers of the Internet,” delivered the keynote speech at F2C: Freedom to Connect 2012 on Monday – watch the video of his speech here. How Should the Internet Governance Forum (IGF) be Improved? by Christopher Steck, Telefonica.